Trips for Kids Santa Cruz is grateful for the continuing generosity and support from Bike Station Aptos with their recent sponsorship to provide four push bikes at wholesale prices. We will soon have four GT Mach One’s, two 12-inch and two 16-inch, for our bike rodeos at community events. Bike Station Aptos will also build the bikes. See our calendar for other upcoming rides. Supervisor John Leopold will host a community discussion about mobility through Soquel Village. Bicycle advocates are urged to come out and speak in favor of adding missing bike lanes on Soquel Drive and other safety improvements. Pre-ride activities at the museum will include bike and helmet decorating, and live bluegrass music from Cayuga Station. Prizes will be awarded for the brightest bike, brightest rider, and most creative costume. The ride departs at 7:00 PM from the Museum of Art and History, and will follow a mostly car-free route along the river levee. Free bike lights will be distributed to the first 30 riders, and lots of other great items will be raffled off! Huge thanks to Bell Sports, Epicenter Cycling, Light & Motion, Cycliq, Lumenus, and Proviz for donating lights and raffle prizes. Riders under 18 must bring a waiver signed by a parent or guardian. We have many open regular ride dates scheduled in our calendar on the first and third Saturdays of the month. Other dates are possible by request. If you have a group of kids that you would like to take mountain biking, request a ride through our website. Have you heard? We now accept donations online. Use PayPal to make a donation, either recurring or one-time. To spare us transaction fees, you can send a personal payment from your PayPal account to donate@tripsforkidssantacruz.org and select “I’m sending money to family or friends”. Read details. As an all-volunteer run organization, all funds go directly to benefit kids in our programs. We are now a member of AmazonSmile. When you shop and purchase eligible items through Amazon, selecting us as your preferred nonprofit charity organization, Trips for Kids Santa Cruz will receive 0.5% of the purchase price from the AmazonSmile Foundation. There’s no cost to you. Every little bit helps us lube the chains and cranks of our bicycle fleet. Donating to Trips for Kids Santa Cruz changes lives through the mountain biking experience. As an all-volunteer organization, your donations go directly to benefit kids. We accept bikes, tubes, tires, water bottles, first aid kits, and any other mountain bike related necessities. Please Contact Us to arrange a donation of in-kind items. We have a openings for taking kids mountain biking. Read details of how to purchase entries for the drawing. All proceeds benefit our programs to take kids mountain biking. 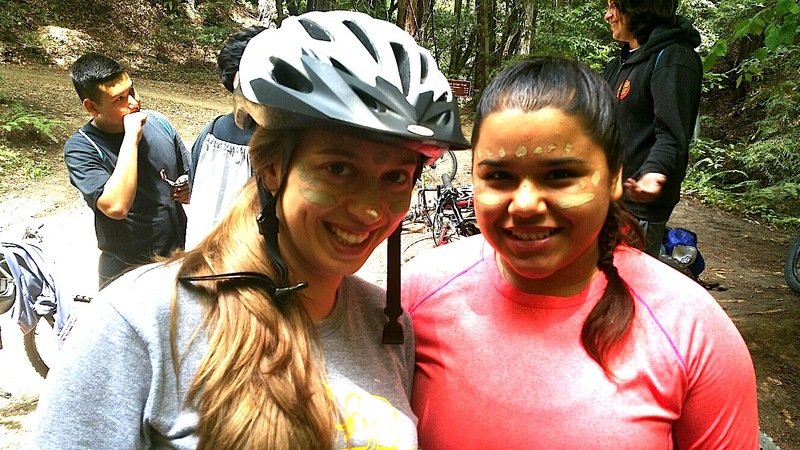 Every year Trips for Kids Santa Cruz has the opportunity to take the youth from the Get Out Get Fit summer camp hosted by the city of Watsonville on a mountain bike ride. Every year is a new adventure. Each year there are at least a few youth who have never been to the forest and now have the opportunity to ride a bike in the midst of the giant trees, flora, and fauna that live among us. Trips for Kids Santa Cruz provides the opportunity for youth to experience riding a bike, but also to experience the power of nature and to challenge themselves to do more than they thought they could. At the end of the camp we ventured to the Forest of Nisene Marks and rode together, encouraged each other, and pushed ourselves to do more than we thought we could. It was an amazing day full of fun, laughter, and physical challenge. We had an awesome ride with a group of ten people with Walnut Ave Womens Center. We rode in the Forest of Nisene Marks to the Epicenter Trail, crossing the creek on our bikes several times from the fire road. We even tried three miles of single track over roots and some technical maneuvering. It was a great day mountain biking! The event is free, but there is an $8 entrance fee if you drive in. Trips for Kids Santa Cruz will be taking a group of kids to Take a Kid Mountain Biking Day. Sign up now! The Monterey Off Road Cycling Association (MORCA) a chapter of the International Mountain Bicycling Association (IMBA) is hosting Take a Kid Mountain Biking Day. All participants must sign a waiver and helmets are required. NO EXCEPTIONS! Activities include basic bike safety, a skills course, trail rides for all ages, prizes, and a barbeque. This local event is part of a nationwide celebration known as Take-A-Kid-Mountain-Biking Day, supported by IMBA. The event purpose is to provide a means for kids and their families to enjoy local trails together. The Monterey County Parks Department will allow bikes on certain Toro Park trails that are usually closed so beginners can enjoy a safe ride. Local bike shops especially BobCat Bicycles have donated products along with contributions from FOX, Cypress Coast Subaru, Carmel Kitchens & Bath, Cleary Bikes, and others. This family friendly and free event will be held at Ramsey Park, centrally located in Watsonville, California. Activity stations including soccer, zumba, martial arts, food demos, healthy snacks and biking will be set up throughout the park grounds for families to enjoy actively participating in. Families will be given a punch card that upon completion will be entered into the raffle including prizes from local businesses. Come out and enjoy a fun filled day of physical activity and healthy snack stations with us this year! Two miles of roadway from Lighthouse Field to Natural Bridges State Park will be transformed into a car-free Pop-up Park. Use PayPal to make a donation, either recurring or one-time. To spare us transaction fees, you can send a personal payment from your PayPal account to donate@tripsforkidssantacruz.org and select "I'm sending money to family or friends". Read details. Shop at Amazon and purchase eligible items, selecting Trips for Kids Santa Cruz as your favorite charity, and we will receive 0.5% of the purchase price. There's no cost to you.